A multi-million pound scheme to reduce the risk of flooding in Rotherham town centre is set to be signed off this month. Now £2.2m of funding has been identified to carry out works that were first discussed when the £20m New York Stadium was in development. The land levels were raised by 2.5 metres using infill to reduce the risk of flooding. Retaining walls, embankments and a drainage system were also planned. The key component of the flood protection scheme was works to the Holmes Tail Goit watercourse, specifically the installation of a new pump and pumping station, designed to force surface water into the River Don in the event of flooding. The Holmes Tail Goit flowed from the canal south of Blackburn Meadows through a number of industrial locations before discharging into the River Don. The industrial growth of Rotherham led to the goit being culverted in a number of locations, including the site of the former Guest & Chrimes foundry which is now home to the stadium and the council's offices. 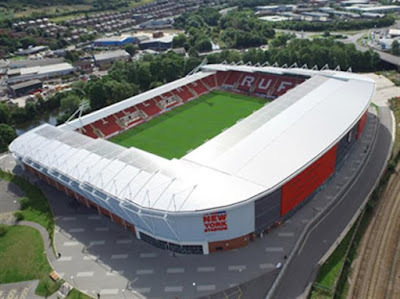 The agreement of the lease for the stadium provided that the company created to build the stadium, RU Estates Limited, would undertake these works and the Council would take over maintenance. Council reports show that RU Estates Ltd expressed difficulty in paying the associated costs of these works and sought a contribution from the Council, although some works have been completed. Reports also show that options around continuing negotiation, mediation, enforcement and litigation have been considered by the Council. If delivery plans are approved by Commissioner Kenny, the Council is set to bear the brunt of the costs - some £1.387m, with RU Estates putting in £684,000 and the Environment Agency topping it up with 212,000. A report to the upcoming Cabinet and Commissioners' Decision Making Meeting, warns: "The absence of these works risks economic loss to the town in the event of a major flood event affecting the town centre, local businesses and transport links. This would in turn affect the reputation of the Council." The funding, which is not considered to constitute state aid to R U Estates, is set to come from the Council's approved Capital Programme.